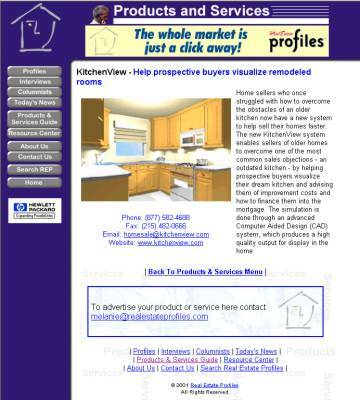 Reach the entire real estate market by listing your products and services in the RealEstateProfiles.com Products and Services Guide. Web-savvy real estate professionals use this searchable guide to shop for and buy the things they need to perform better. Make sure they can find you by purchasing your own full page Web directory listing. Current site hit count 50,000/month and climbing!